Fender Stratocaster is among the oldest and most popular guitar models in existence. Its shape had a significant impact on the industry, resulting in a number of modified body styles taking over the market. Anyone who has ever played a Fender Stratocaster knows just how sophisticated this guitar is. However, it has one flaw. It’s on the expensive side, making it quite unattainable for the majority of guitar players around the world. Fender recognized this early on, and decided to release an entry level guitar that looked the part, and was perfect for beginners. They did this through a daughter company called Squier. Let’s dive into this one – Squier Affinity Stratocaster Review, go! From afar you probably wouldn’t be able to distinguish the original Fender Strat from a Squire one. It has the same shape, same finish variations, and overall the same appearance. Once you come closer you will definitely start to notice things. For once, Squire Strats are mass produced in Asia. Believe it or not, both Fender and Squire use Alder as the tonewood of choice. The only difference is that Alder used by Fender is high-quality wood that only grows in a small patch of woods in Ohio. The one used by Squire is a much cheaper kind, but one that still has a good portion of positive properties that alder is known for. The finish on these guitars is generally pretty decent. Everything fits well, and you won’t find poor craftsmanship anywhere. Even though these are affordable guitars, Fender is still very much adamant about proper quality control. The neck is a Maple bolt on which comes with either a Rosewood fretboard, or a lacquered Maple one. This is the same combo you will find on a Fender’s Stratocaster. The maple fretboard is extremely soft, easy to play and fast. We can go so far and say that it’s better than fretboards on some guitars that cost five times as much. Everything up to this point was pretty much on point when it comes to similarities between Fender’s Strat and one made by Squire. Hardware and electronics is one aspect where these two guitars aren’t even in the same league. Squier Affinity Stratocaster comes with a floating tremolo bridge that is there mostly for show. As soon as you start working the tremolo in any significant way, you will experience vibrations in the bridge, and the guitar will most likely drop out of tune. 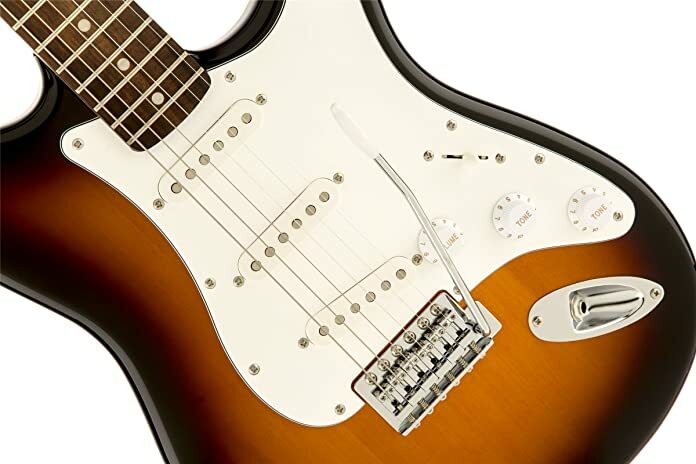 The bridge is arguably one of the weakest points on Squier Affinity Stratocaster series. One quick fix you can apply yourself is to tighten the bridge down completely and give up on the tremolo. Tuners are a similar story. It’s a cheap set that doesn’t take well to abuse. As long as you don’t change your tuning often, you should have too much trouble with the tuners. However, don’t count on them being 100% reliable. Squire Affinity Stratocaster comes with three single coil pickups which are controlled by one volume knob, two tone knobs, and a pickup select switch. This is the same configuration you will find on the original Strat. We’ll talk about their performance further down in the article, but one thing is apparent straight away. The main drawback of any single coil pickup is the humming side effect. This is something even the high tier single coils are still having trouble with. As you can imagine, single coil pickups on an affordable guitar will only multiply this issue. Pickup hum is one thing you can definitely expect to find on this guitar. How severe it will get depends on your playing style and several other factors, but it’s definitely obvious. If you exclude the humming issue we just mentioned, the sound this guitar offers is actually pretty decent. Sure, it won’t be on the same level as a Fender’s Stratocaster, but the core experience is there. The tone is pretty warm, sensitive and suitable for most tamed genres of music. If you’re looking for a guitar that will give you that face melting distortion, you should probably look elsewhere. These single coils are just not capable of dealing with high gain distortion. With that said, stuff like blues comes naturally on this Squire. It may take some time and effort to dial the right tone, but it’s possible. Generally, if you get this guitar while understanding its limitations, you will love it. There are several great things Squire Affinity Stratocaster offers. First and foremost, it’s an affordable guitar. For the money you’re expected to pay, you get the legendary Stratocaster shape and other features both of these models share. The neck is smooth and fast, especially if you go with the lacquered Maple version. Overall this guitar is a great beginner instrument. With affordable price come some drawbacks. We would definitely like to see a different bridge on the Affinity. Squire might have overreached a bit with a tremolo bridge. You just can’t have a cheap and reliable tremolo bridge, no matter how you do it. A standard fixed “ashtray” bridge would work much better. Another thing we’d like to see improved are the pickups. They have a decent sound but the humming is almost unbearable at times. Unfortunately, all of these improvements would increase the price of the guitar, which beats the whole point of its existence in the first place. Even with all of its pros and cons, Squier Affinity Stratocaster has its place in the world. It’s an entry level guitar, and as such it offers a more than decent value for the money. If you are a fan of Stratocaster aesthetics, this Squier is the most affordable and most authentic way to enjoy a Strat. This is a great guitar for the listed price, and we can only give it a thumbs up. Good stuff, great bang for the buck!